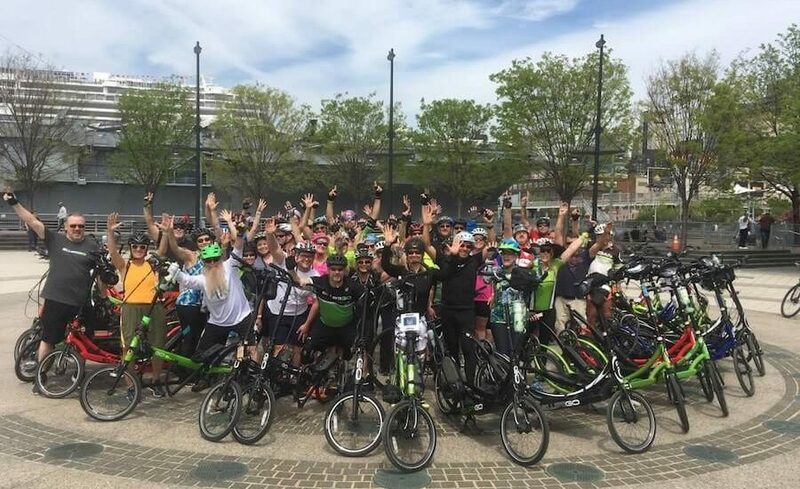 Hard to believe it was 6 months ago where in a sea of 32,000 bike riders there were 80 ElliptiGO riders from around the world ready to GO in The Five Boroughs Bike Tour (T5B) in New York City. Time goes fast! After a much anticipated trip, Henry, my partner, and I finally got to meet our ElliptiGO Facebook friends across the globe. Rides were organised each day by our illustrious Leader, Thomas Russo, with some of the highlights being the night ride to Times Square where we sang with the ‘Naked Cowboy’, our ride across Brooklyn Bridge and of course T5B ride itself which was a 64km ride through closed off streets to cars in Manhattan, Bronx, Queens, Brooklyn and Staten Island. It’s the only time of the year all the streets are car free! We had 4 days of absolute outdoor fun, many scenic sights, much camaraderie with frequent visits to the Dead Rabbit for after ride Margaritas and ‘shot’ challenges at various establishments. A great unique adventure to celebrate my 60th!! !